Delta Society St Louis Veterinarian of the Year, Co-Winner with Dr. Deborah Polleck, for the promotion of the human animal bond. Support Dogs, Inc. Veterinarian of the year. Geriatric Medicine- Diagnostics and management of diseases to maximize quality of life. 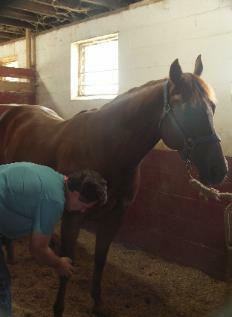 Mixed Animal Practice- dogs, cats, horses, livestock, exotics including 'pocket pets',reptiles and birds including poultry. 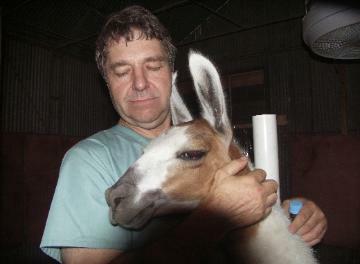 Mentor program for pre-veterinary students. I enjoy working with animals and their family members. I try to always be available to answer questions and deal with their concerns. 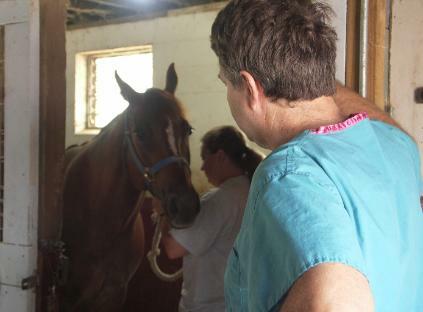 Dr. Goman examining staff member Trish's horse, Kelly, for a hoof problem while Lauren a pre-veterinary student observes.